Are you a school administrator or an involved parent? If so, you know that teachers are some of the hardest-working professionals in the business…it’s time their efforts were rewarded! At The Bag Ladies, we specialize in creating beautiful, long-lasting bags for businesses and individuals. Cotton tote bags for teachers are some of our most popular items. Here’s why you should consider a tote for your next teacher gift! Cotton Totes are Customizable What teachers tell us they love most about tote bags are the personalization. 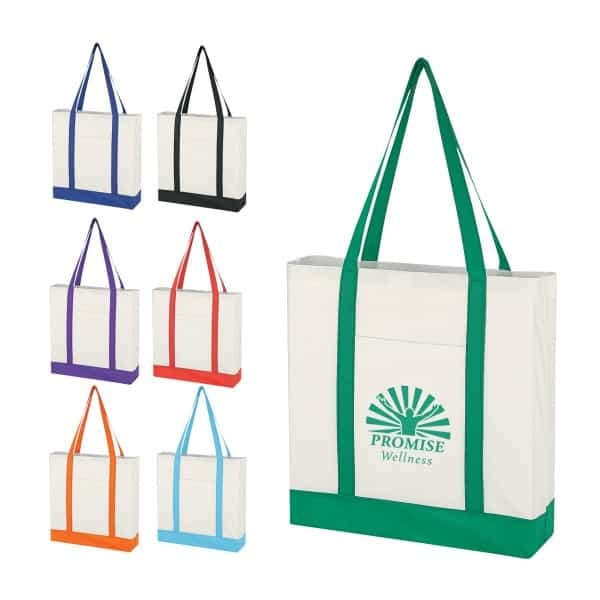 We offer totes in a wide variety of colors and materials and we can even customize a bag specifically for your school! Print your logo, mascot, or even use your specific school colors to give teachers a gift they can be proud to show off. For that extra-special something, consider embroidering each tote with the teacher’s name or initials. Tote Bags are Useful for Teachers Ever noticed how teachers always have their arms full? From papers to grade to art supplies to refill, teachers are always lugging lots of stuff back and forth to the classroom. Durable tote bags that are easy-to-clean make teachers’ lives easier…and give their arms a break! Totes are Unisex One of the best things about tote bags is that they’re not inherently feminine like purses or handbags. Nylon totes are a good choice for male or female teachers, and a principal in her pantsuit looks just as good carrying a tote as the Phys. Ed. Instructor in his shorts. Save Money with Tote Bags Think tote bags are prohibitively expensive? Think again! The Bag Ladies offers a full line of budget-friendly tote bags designed to purchase in bulk. Made from the same great materials (cotton, canvas, etc.) as more rigid totes, some of our customers actually prefer our economical tote bags for their lightness and washability. Ready to order tote bags for teachers at your school? The Bag Ladies can help! Give our team a call today to talk about colors, size, shape, and more…we’ve got a solution in the price-point you’re looking for. Your teachers deserve the best…let us provide it for you!